Some people think E Bay is the greatest digital success story since DOS. I personally am going to make sure my husband puts that block in to its website as he promised he would . We cannot afford another E Bay adventure. Recently I read somebody sold a grilled cheese sandwich on eBay for 28,000 dollars. It had a burn mark in image of the Virgin Mary on one face and had been stored in plastic for ten years. The seller said it had absolutely no mold on it at all. I was glad to see this story. 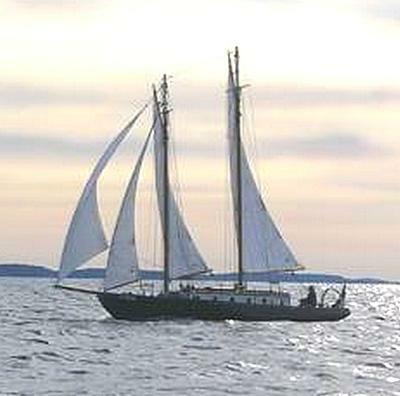 The 48 foot fifty year old schooner we purchased last fall on eBay didn’t seem half as unlikely as a blessed sandwich. And we did get to see an interesting new part of the world unlike any we had ever before experienced. But my checkbook has had enough adventure for a little while. I’m no stranger to acquiring “new” old mostly biodegradable boats. I’ve bought and sold a half dozen over the last 25 years. Most were modest in size, though, a wooden homebuilt Sunfish type, a 90 year old St. Lawrence skiff, and a 19 foot Lighting day sailor being typical. All my deals were also made face to face with the boat buyer or seller or, on one occasion, with a yacht broker. But my husband, a man of courage and fortitude, thinks big. He started acquiring boats a bit later in life than I and has been considerably bolder in his commitment to repairing them. A 26 footer with several holes in her bottom and a 35 foot bare hull-to-be-finished didn’t phase him. He restored the 26 footer and had made a start on the bare hull project before his fateful foray onto the eBay website one fall afternoon. He was, he claimed, looking for parts for the bare hull project. Check out this interesting boat-it’s right over in Baldwinsville, he said. 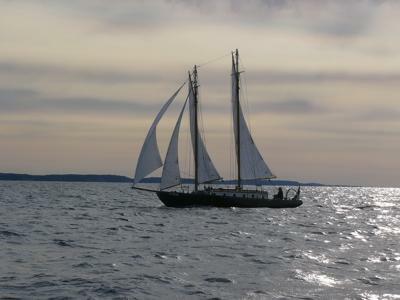 Looking over his shoulder at the listing I pointed out the boat was not thirty miles from our home in Baldwinsville but rather was in Baldwin, wherever that was, but she was indeed intriguing with her classic lines, gaff rig and Nova Scotia heritage. We drove down for a look (Baldwin being on Long Island about 400 miles from our home in upstate and decided to bid on her. 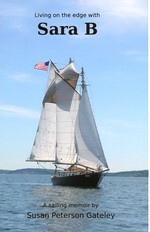 Five days later we were the new owners of the good ship "Sara B", a Tancook schooner, 38 foot on deck, 48 feet overall. Now we had to get our eBay purchase home and UPS and Fed Ex weren’t an option for this item. Sara B was on western Long Island right next to Gotham. This is an area of the world widely viewed by upstate New York provincials as “the belly of the beast”. In this world of two million dollar houses and ninety dollar an hour labor charges, where most marinas prohibit do-it-yourself oil changes we were babes in an asphalt jungle. Freeport, the boat’s home, not all that far from the Hamptons, was a fifteen minute drive down the road from Amityville where we went to DMV to register her. We knew all about these places from Hollywood movies. Our new old boat was smack dab in the middle of a demographic of unparalleled affluence and influence and we couldn’t wait to get her out of there. Help! Would three lake sailors be able to navigate the winding back channels of the salt marsh and the busy byways of New York City harbor in late November? We did manage to extricate her from Gotham but it took some doing. We were lucky I think, in that they took the orange alert down from New York harbor two days before we left. You can read the whole story on her website plus lots of fixing her up information. 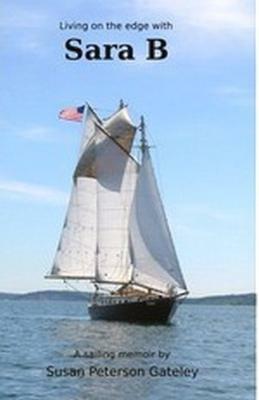 Google Schooner "Sara B" and it should pop up. I'm working on a book length memoir about our subsequent adventures which I hope to have out next spring. Read you left turns, only but love the idea of clean water. I was young and have never forgot his lab fish that were bent and cold, only swimming in circles, water you could not see through. Even though I relate to a dark sea as a healthy sea, baby blue is a nice color but lacking nutrients. I know the lakes that have the zebra mules in them have become clear. I know they're a pain for industry but the amount of paper used and pushed by the DFO and government, spending money on science as long as they say nothing bad, this should change find a problem fix it. Government are failing at the public service level, time to go private, like ducks unlimited took the lead out of duck hunting the USA, stopped shelling the lakes, fishing still use lead this would be a start. Explore Lake Ontario in a quest for knowledge and hope.